Past a McDonald’s, past a check-cashing center, past a textbook rental and across the street from Family Dollar and AutoZone stands the Dollhouse Dance Factory. The West Jackson, Mississippi, studio sits quietly on Ellis Avenue, just off Interstate 20. Bold red letters that spell out D-O-L-L-H-O-U-S-E bounce off blue skies. The sign is a standout at the tail end of a strip mall that also houses a Boost Mobile, Boss Lady’s Luxury Virgin Hair Salon, and a Wing Stop. It’s 6 o’clock on a Wednesday in mid-May, which means a few things: The school year is still in session, it’s time for Doll rehearsal, and it’s the first day of the four-day shoot week for season 3B of Lifetime’s Bring It! The reality show, about a team of Mississippi majorette dancers, their exuberant and brusque “Coach D,” and the DDPs (Dancing Doll Parents), is a bona fide hit, averaging an impressive 1.3 million viewers on a Friday night. Along with Project Runway, Devious Maids, Little Women: LA, Dance Moms, and Atlanta Plastic, it’s among the network’s most popular shows. Faith Thigpen (left), MaKalah Whisenton (center) and Daija Wilson (right) practice at the Dollhouse Dance Factory before a competition. And whether viewers know it or not, the Dolls are rooted in the SWAC majorette dance auxiliary tradition. SWAC is, of course, the Southwestern Athletic Conference, made up of 10 historically black colleges and universities in the southern states that participate in Division 1 sports — nearby Jackson State University (JSU) is a member. Legendary SWAC marching bands include Ocean of Soul and JSU’s own Sonic Boom of the South. 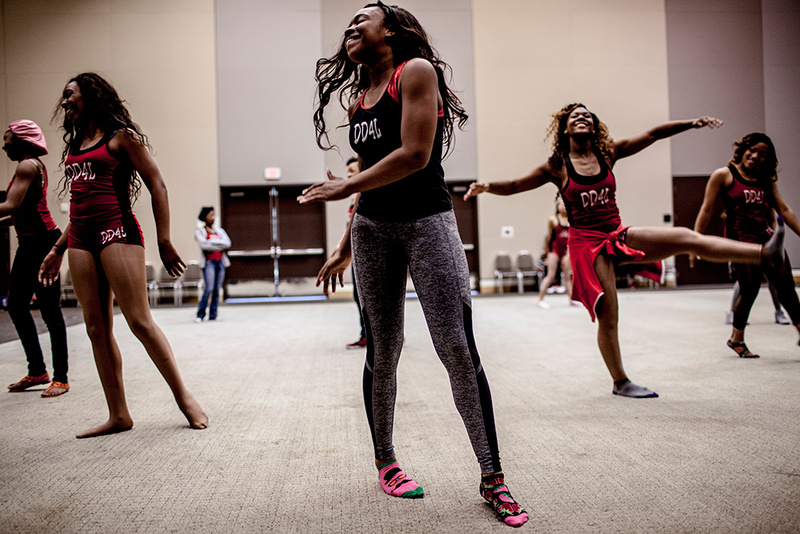 Legendary SWAC dance teams include the Black Foxes and Golden Girls. 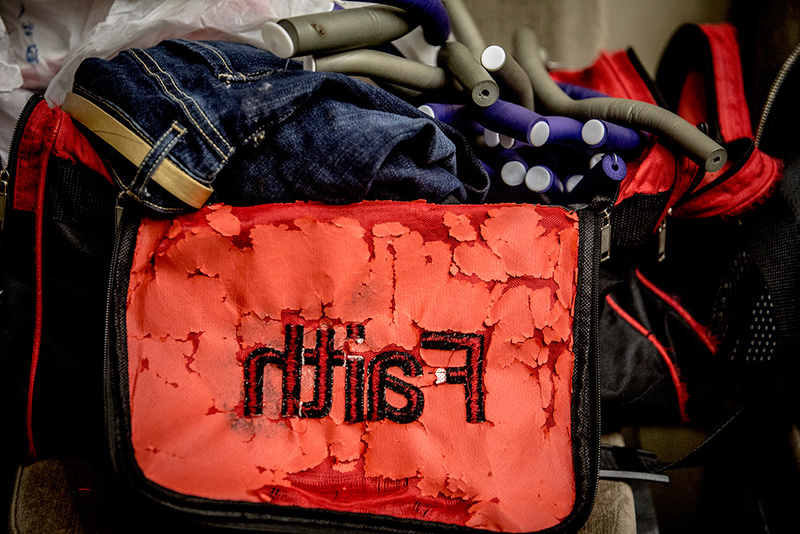 The famed, at times troubled J-Settes are so influential they are a verb. This fevered SWAC experience includes thundering drumlines, high-stepping drum majors, and majorette teams (no baton, thank you) who are as poised as they are provocative. Even if you’ve never been to a game, you’ve experienced the SWAC culture: Think Beyoncé’s field show formation at Super Bowl 2016, or choice moments of J-setting choreography in her 2008 video for Single Ladies. 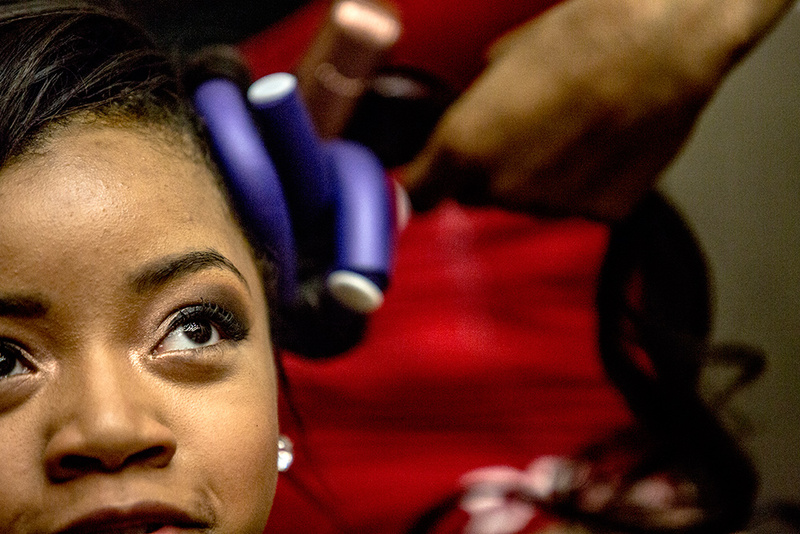 Tradition, pride, blackgirlmagic, excellence, soul — SWAC could as easily be known as swag. And in its way, that swag is the bones of the Dollhouse. Coach Dianna Williams and her team after a long night of practice. Camryn Harris (left) and Imonje Mignott (right) goof around between stands at the Dollhouse Dance Factory. The girls are athletes. 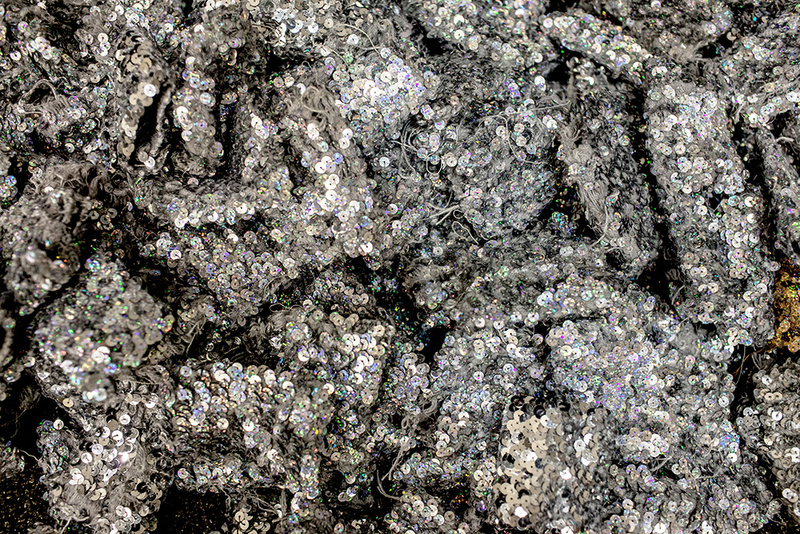 Muscular and brown — a sea of builds and shades. Most of them have weaves that are as much about protecting their natural hair underneath as they are about the ability to whip it. Camryn has over 600,000 Instagram followers, and there are cameras all around, but the girls in general seem mostly (and oddly) unaffected by their popularity and the production cacophony that whirls around them. Maybe it’s because they’re training. Learning new choreography. Focused. It’s May in Mississippi, which means even at 9 p.m., it’s hot. The Dolls steal glances at each other as former captain, now-assistant coach Kayla Jones, 19, walks over to the air conditioner. You can hear a pin drop in the Dollhouse. No one dares smile, not even the production staff. Coach Dianna Williams (right) zones out for a second during downtime at practice. Next to her is assistant coach, Kayla Jones. Dance was the language young Dianna wanted to speak. “Tap was a love of mine,” she says. As a youngster she trained at the Angie Luke School of Dance in Clinton, Mississippi. “I took dance all through high school — ballet, jazz, hip-hop, contemporary, modern.” She also played in the band — clarinet, xylophone, and the cymbals. “And,” she said, “I’d hold the flag.” Teenage Dianna also loved going to the parades downtown and seeing the J-Settes in their capes and white boots, owning the moment. A coach and her team. The summer of 2001, Hartwell moved back to Jackson. Williams, then 21, followed, and transferred to Jackson State, where she eventually earned a bachelor’s degree in criminal justice. Within a month of her return, she tried out for the Prancing J-Settes — and did not make the line. That very next month, on the advice of her grandmother, Williams decided to create a team of her own: the Pied Piper Dancing Dolls. The team’s colors, like her grandmother’s nursery school’s, were green and gold. For the next decade, the Dancing Dolls practiced in Grove Park under a pavilion and on the tennis courts, and at the gymnasium at Cathedral African Methodist Episcopal Zion Church. Williams changed the troupe’s colors to red and white in 2003, a nod to Delta Sigma Theta — her mother is a member of the sorority. Williams has attempted to join the organization as a legacy, but never got a callback. 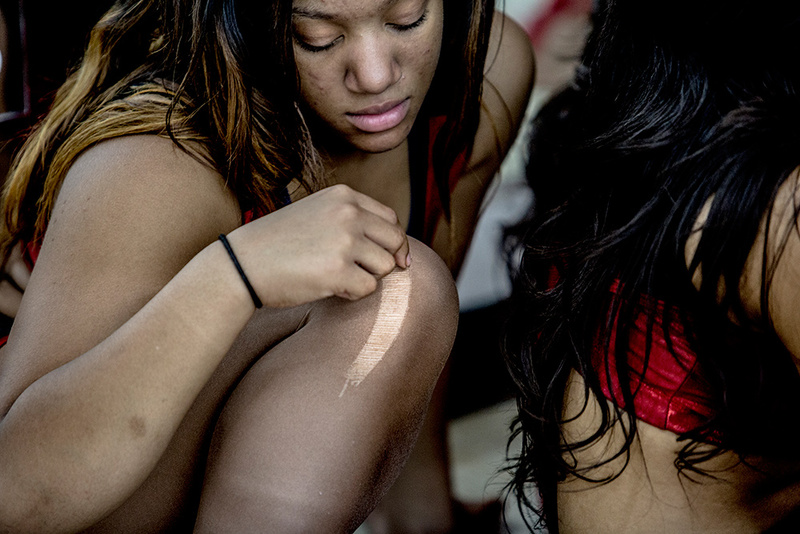 “I guess,” she said, shrugging, “they didn’t like me.” Williams also continued to try out for J-Settes — five times, she says — never making it past body cuts, wherein the girls are scored by how they look in the uniform. Coach D walks to the stereo and presses play. J-Lo’s 2014 EDM-ish, booming “Booty,” the song she did with Iggy Azalea, thunders through the speakers. Have you seen her? / On the dance floor / She’s got the boom / Shake the room / That’s the lightning and the thunder. “I told y’all every time y’all move it should be like a what?” Coach D says, loudly. There are just two days before the Last Man Standing competition. Williams takes a seat on the Dollhouse floor and confers with her coaches, Jones, Ariel Kinsey (who works on field shows) and Andre Mitchell (who choreographs for the battle squad). Papers are spread out before them, with diagrams of stands that look like football plays. It’s choreography — dances with names such as Tick Tick Boom, Cuckoo Clock, My Chick Bad and Frogger. Until a year ago, each member of the Battle Squad had to have memorized at least 60 stands, because you never know which one the captain was going to “throw” at an opposing team. Now, because of time constraints due to their hectic Bring It! production schedule, Williams, with her assistants and her Dolls, strategize and make decisions depending upon the competition. From top to bottomClockwise, from top left: The beginning of a long Friday night rehearsal the Dollhouse Dance Factory; Dancing Doll supplies; the Dancing Dolls backstage, before a competition; Tanesha Roberts checks her tights at practice at the Dollhouse Dance Factory. Camryn throws the first stand — meaning she alone executes the first four counts — and on the second four counts, the other girls replicate her moves. 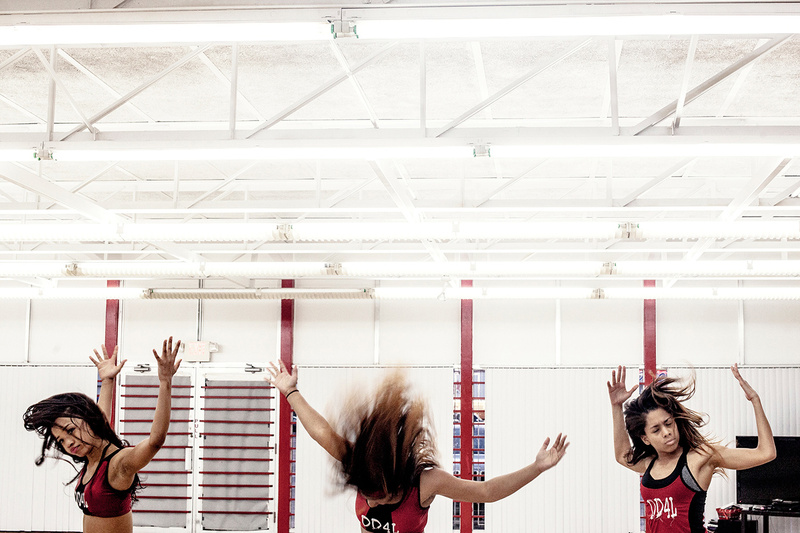 MaKaylah and Tanesha do crisscross flips in the air. A flurry of sidekicks blur the movement. Hair bands fly off. Heel stretch leap! Step grab. Jump, swing your leg up, catch it, pull squeeze! Don’t cut your moves off! Look at the line. Is your line straight? Buck buck buck buck! Arch your back! That’s how it goes down at the Dollhouse. Captain Camryn doesn’t even need a pump, but hot, quiet tears roll down her cheeks. The way it goes: Camryn’s mom, Mimi Chandler-Harris, a hairstylist, picks Camryn up from school, Camryn grabs a bite, does some homework, gets dressed for practice and heads to the Dollhouse. After three or four hours at rehearsal, Camryn and Mimi head home, maybe practice some more just to retain the choreography (sometimes with another Doll in tow). Then Camryn rolls her hair, finishes the rest of her homework, and talks to her boyfriend George. They’ve been together a little over a year. Shower. Bedtime. Wake. Repeat. Camryn used to be the timid little girl with the big red bow. Last season, when she earned a perfect score for her “8th Wonder of the World” solo in the Battle Royale — her choreography a mix of African, lyrical, majorette and hip-hop — she truly tapped into the power within. And tapped into all practice and sacrifice she’s put in. The girls do a lot. Rittany Anderson is aunt of Dancing Doll Crystianna, 13, who started out as a Dancing Doll at age 7. And she, like Mimi and all of the Dancing Doll Parents is at once advocate, protector, manager, and cheerleader. Anderson, as committed as she is to the Dolls, makes sure Crystianna participates in other extracurricular activities. Her niece, besides maintaining the hectic Dolls schedule, is a school cheerleader. Anderson is known on Bring It! for her outspokenness, and wants to make sure Hollywood keeps the girls’ best interests at heart. Because Jackson is home, but it isn’t the whole world. They know it. Everyone is dancing toward something bigger than trophies. High noon on a Saturday. In a huge conference room at the Jackson Convention Center, the Dancing Dolls are laughing and running and screeching and falling onto the floor in heaps of giggles. They make dubsmash videos, faith-fall backward into each other’s arms and sit on each other’s laps. Soon they will change into their costumes — silver and black — and do their hair and makeup. Captain Camryn will run through choreography in mismatched socks. The Dancing Dolls doing a hair refresh. One minute, Williams is in the dressing room with the girls, separating silver wristbands from iridescent ones. The next she’s on the sidelines checking out the competition. No Hervé Leger bandage dress today — instead it’s black leggings, white Jordans, a green tank and a black Tau Beta Sigma jacket, the national honorary band sorority that she was recently inducted to by Mississippi’s own Alcorn State University. 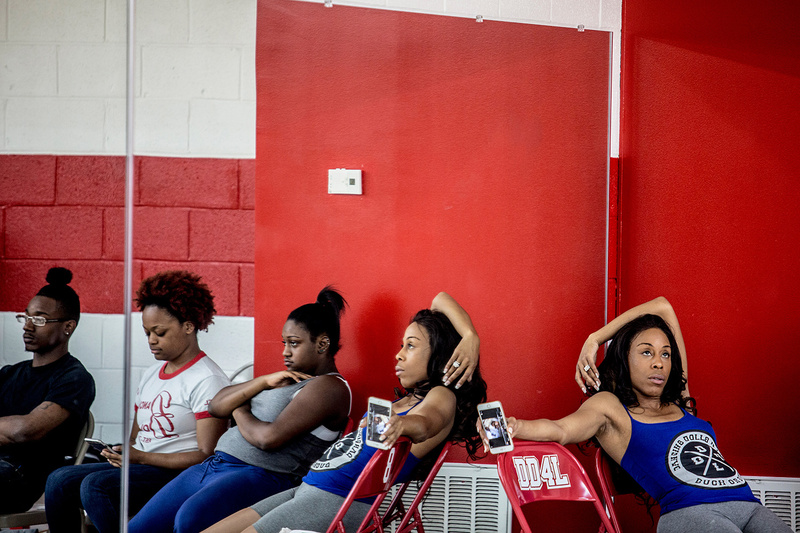 From top to bottomClockwise, top left: A fluff of sequined cuffs in the Dancing Dolls’ practice room; Dancing Doll Daija Wilson stretches on the floor of a practice room before a Dancing Dolls competition; Faith Thigpen is ready for competition in Jackson; in a practice room at a competition, Denicia Diew (right) takes a photo of Faith Thigpen. Lil’ Jon’s Work drops and polite, humble “dolls” shapeshift into sweet-faced killers. Camryn throws the first four count, rubbing her hands together like she’s planning a coup. Her girls stand behind her, staring the other team dead in the eye, just like Miss D taught them. They do backbends and point one foot toward the sky. They do pop-ups from their backs. They do death drops, which Coach D can still do, with swag. When the stand is done, they point at the competition. Slice their necks with their hands. In other words: You’re dead. And we’re everything. Dancing Dolls at a competition. The crowd has thinned. Once excited children are falling asleep. At around 11 p.m., for the umpteenth and last time of the night, Coach D leads her girls to the floor, this time against the Divas of Dance. The Ying Yang Twins’ 2005 Salt Shaker provides that final, crunk burst of energy everyone needs. Captain Camryn throws the stand, gives face. The Dolls are uniform and crisp. Unbothered, and not tired. High kicks are high, toe touches are wow. They move like the Southern girls they are — rooted, wild, free. When it’s over, each team takes its place on the floor and waits for Fever to announce the judges’ decision (sorry, no spoilers here). At midnight, 12 hours after they arrived, the Dolls and their families disperse and go home. Earlier in the week, assistant coach Jones, who attends Hinds Community College in Raymond, Mississippi, and is double majoring in dance and child development, spoke a lot about the reality show perception people have of the Dancing Dolls — versus their actual reality. “A lot of people watch our show and think we’re just a bunch of girls out here shaking it fast,” she says, rocking plum lipstick and a huge smile. “In actuality, I feel like the girls use more energy and stamina than some of these football players out here, because we have to concentrate, breathe, run, dance. You have to say so much without saying anything. All through dance moves. And stay on top of our grades. And be a child.” Jones taps her foot, as if she’s had to express this a million times. Bring It! airs Fridays at 9 p.m. starting July 22. Karen Good Marable is a writer who lives in Brooklyn, New York. If dared, she WILL bust out the entire choreography for "Beat It" AND "Pleasure Principle," as the world is her dance floor. Sha'mon!